CarGurus has 78 nationwide Rapide listings starting at $59,995. A 4-door rocket on wheels, the 2014 Aston Martin Rapide leads a double life as a capable family hauler, thanks in part to its decent trunk space and fold-down rear seats. While the 2-passenger second row remains a tight fit for most adults, due in part to the sedan's tapering, low-slung roofline, which seriously intrudes on rear-seat headroom, the younger set will be ensconced in the lap of luxury, just as you'd expect from a world-class upscale sports car. The Rapide's functionality also makes its six-figure price tag a little easier to justify for buyers with young families. Of course, beyond room for 4 passengers in a 2+2 seating arrangement, the Rapide delivers plenty of car for the money. Numerous reviewers and owners consider it one of the most beautiful cars in the world, with its long, muscular hood, flowing lines, stylish side rakes and curvy rear haunches. Up front, the distinctive wide-mouthed aluminum mesh grille, redesigned for 2013, remains somewhat controversial, with critics mixed on its attractiveness. But it serves a purpose, Aston Martin notes, giving the Rapide a unique look in the automaker's stable. It's a subtle but important requirement, since many felt the cars from Aston Martin were all beginning to look the same. In addition, the new grille was designed to comply with European pedestrian impact protection standards, giving it a safety aspect. Despite the Rapide's 4-door sedan configuration, Aston Martin continues to classify the vehicle as a 4-door coupe in an effort to focus on its sportiness, rather than its functionality. All 4 doors feature frameless windows and move slightly upward when they swing open, causing Aston Martin to refer to them as "swan wings." The rear doors are also relatively short, making entry into the rear seat a little tricky. But they're nods to the Rapide's unique design, which also includes a gracefully arced hood, swept-back HID headlights and a trunk-mounted spoiler with a pronounced lip, which helps improve aerodynamics and stability. Other exterior features include flush door handles, power folding heated exterior mirrors, LED taillights, dual exhaust pipes and 20-inch multi-spoke silver alloy wheels with a diamond-turned finish. Buyers can add a number of available wheels, including 20-inch Gloss Black wheels or 20-inch, 20-spoke polished aluminum ones. An optional Carbon Exterior Pack dresses up the Rapide with such features as a front splitter, a rear diffuser, mirror caps and rear taillight infills, all made from carbon fiber. The Rapide's exterior attractiveness results in part from its well-balanced proportions. Aston Martin says the vehicle adheres to the Golden Ratio, with an ideal length, height and width, resulting not only in visual appeal but in optimal weight distribution and improved agility. Testers concur, noting that although the Rapide tips the scales at a rather hefty 4,387 pounds, it handles its weight well. At 197.6 inches in length, the Rapide stretches nearly a foot longer than the DB9 Coupe, upon with it's based, allowing for the extra row of seats. That extra length also gives the Rapide a classic feline-like side profile. Power comes from a new naturally aspirated AM11 Gen4 6.0-liter V12 engine, updated in 2013 and shared with the DB9 as well as the new Vanquish. For this application, the automaker pumps up the ponies to 550, making the Rapide the most powerful 4-door Aston Martin has ever produced. Torque tops out at an impressive 457 lb-ft, delivered through a wider range to ensure optimal acceleration. A mid-mounted Touchtronic 2 6-speed automatic transmission channels all that power, although some reviewers would like to see the vehicle equipped with a newer 8-speed transmission, as many of its competitors are. The transmission includes a glass shift knob and steering-wheel-mounted magnesium paddle shifters, enabling drivers to shift manually. Although it lacks Launch Control, the Rapide still manages to rocket from 0-60 in just 4.7 seconds, although some testers put it as low as 4.5 seconds. Speed tops out at 190 mpg, while fuel economy numbers check in at 13 mpg city/19 highway. During the 2013 update, Aston Martin dropped the V12 about an inch further down in the chassis, lowering the vehicle's center of gravity and improving its handling and stability. Underneath, the Rapide's standard 3-mode Adaptive Damping System includes Normal, Sport and Track settings, enabling drivers to choose their preferred handling and ride specifications on the fly. The system also makes adjustments to the ride depending on road surfaces and driver inputs. In addition, the rear-wheel-drive Rapide comes equipped with a limited-slip differential as well as anti-dive geometry in the front and anti-lift geometry in the rear. Servotronic power-assisted, speed-sensitive rack-and-pinion steering and dual-cast disc brakes in both the front and the rear are also part of the standard package. Testers say the Rapide moves effortlessly through slalom tests and opens up nicely at highway speeds. As expected, the Rapide delivers a smooth, refined ride, but stiffens up appropriately when the driver selects the Track setting. Some reviewers find the Track setting too hard on the Vanquish, but just right on the Rapide. Although it's longer and heavier than the DB9, the Rapide feels tight and refined, thanks to its stiffened body. There's minimal lean in corners, reviewers say, and the steering system matches or exceeds those in such competitive vehicles as the Porsche Panamera. The quality and refinement continues inside the Rapide's luxurious cabin. All the expected amenities are here, including Bridge of Weir leather upholstery, heated front sport seats with power adjustment and memory, walnut interior trim and a leather-wrapped sport steering wheel. Navigation with a pop-up screen on the dash comes standard, although some say it needs updating. Tunes come from a 1,000-watt, 15-speaker Bang & Olufsen audio system with Bluetooth, satellite radio and a USB port. Automatic climate control, an auto-dimming rear-view mirror and even an umbrella in the trunk are also included in the standard package. Beyond that, Aston Martin offers a wide range of customization options, including an available Piano Black Interior Pack, which adds a black, mirror-like shine to accents on the dashboard and center console, as well as on the instrument panel and steering wheel. Other options include duotone black and red perforated leather upholstery, a twin-screen rear-seat entertainment system with a 6-DVD changer, personalized sill plates and a variety of alternative wood trims, including mahogany, bamboo and ash. While the executive-style rear seats remain too tight for taller adults, front-row passengers will find plenty of legroom and headroom. Cargo space in the trunk measures 14 cubic feet, which expands to around 31 cubic feet with the rear seatbacks folded down. Eight airbags come standard in the Rapide, along with front and rear parking sensors and a Dynamic Stability Control system, which was tweaked to handle the V12's increased power and torque. The short list of competitors to the Rapide include such 4-door sports cars as the more affordable Mercedes-Benz CLS-Class, BMW 7 Series and Audi A7, as well as exotic fare like the Maserati Quattroporte Sport GT S and the Bentley Continental Flying Spur, in addition to the Panamera. Production of the Rapide currently takes place at Aston Martin's plant in Graydon, England. 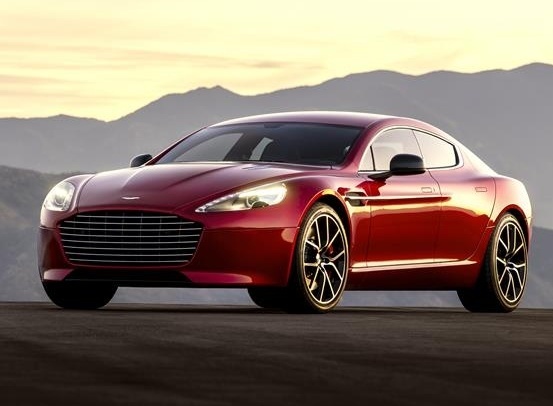 What's your take on the 2014 Aston Martin Rapide? Users ranked 2014 Aston Martin Rapide against other cars which they drove/owned. Each ranking was based on 9 categories. Here is the summary of top rankings. Have you driven a 2014 Aston Martin Rapide?